CHRR at the Ohio State University is an interdisciplinary research center with a long history of projects funded by the Bureau of Labor Statistics in the US Department of Labor, the National Institute of Child Health and Human Development, the National Science Foundation, the Organisation for Economic Co-operation and Development, the State of Ohio, and a variety of foundations, agencies and research organizations around the world. Over the past ten years, we have brought in revenues of more than $100 million. CHRR works with investigators from many colleges and departments at The Ohio State University, including the Social Sciences, Education, Public Health, Social Work, Medicine, and the John Glenn College of Public Affairs. We have a staff of 60 multidisciplinary, cohesive, and low-turnover professionals who have extensive experience helping researchers design surveys, collect data, manage large data-sets and integrate all phases of their research program into a coherent whole — we take pride in taking on the most challenging projects. 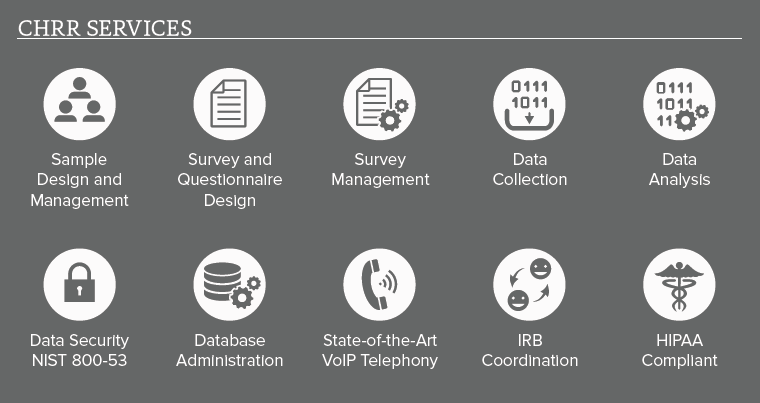 As experts in SURVEY SCIENCE we are here to help you make your research better. CHRR’s research support staff has decades of experience conducting large and small scale surveys across a wide range of disciplines with background knowledge in economics, sociology, psychology, health, GIS, management information systems, and more. We also have significant experience with large administrative datasets, with the ability to match data from multiple sources, provide de-identified data for research, and create interactive dashboards and data visualizations. The NLS, sponsored by the U.S. Bureau of Labor Statistics and Department of Labor, is the largest project at the center. These surveys gather information on the labor market experiences of American men and women, and have involved repeated interviews of more than 50,000 US residents since 1966. Each of the survey cohorts is a national sample in a specific age range, selected and weighted so researchers can draw conclusions about the nation’s population. The surveys provide researchers with the opportunity to study large panels of men, women, and children over significant segments of their lives. CHRR is home to the American Population Panel, whose members participate in social science and health related studies. The APP is a resource to help researchers target various population subgroups and match potential participants to your studies. All panel members are 18 or older and U.S. residents. The National Sports and Society Survey (NSASS) is a landmark survey of 4,000 U.S. adults that collects information on sports-related attitudes and the dimensions and contexts of sports involvement experiences. Specifically, the NSASS asks about one’s opinions on sports-related issues, current sports-related experiences, sports-related experiences while growing up, and child’s sports-related experiences (if applicable). This information is complemented with background information on the respondents and their reports of their health and well-being, behaviors, and social connections. The Ohio Study, also known as The Adolescent Health and Development in Context (AHDC) project, collects information on how children spend their time outside of the home and school: where they go, who they spend time with, and what they do when not in home or school. Adolescents who get involved with drugs, violence, or risky sexual activity typically do so when they are not at home or in school, so it’s important to understand how this time is used differently across families and communities. CHRR is conducting the LISCI on behalf of Purolator International, a U.S.-based supply chain logistics solutions company. The survey gauges the state of the local manufacturing industry by using survey feedback from Long Island-based manufacturers. Research data from the survey helps forecast the overall strength of the local region’s economy.